Before heading off on today's major event I wanted to walk into Grasmere village. I needed to pick up a couple of extra t-shirts as well as look for some acclaimed gingerbread that I'd been told about. I found a shop that appeared to be selling the gingerbread but the shop assistant was upfront and admitted that it wasn't the "famous" Grasmere gingerbread. It was more a ginger shortbread. It still sounded interesting and I was impressed with her honesty so I bought some. From there I hopped in the car and headed towards Keswick. On the way I planned to stop off to view (lake) Thirlmere if I got the opportunity. Thirlmere is actually a man made reservoir formed from two existing lakes, but is still impressive. A parking spot did present itself along with a short walk to a view point. After that brief interlude I continued on to Keswick. In total it was only about 30 min drive from Grasmere and I was beginning to become familiar with the road. First stop in Keswick was a visit to the Derwent Pencil Museum. The Derwent Pencil Factory used to be in Keswick and I believe they used to do factory tours. The factory has moved so I figured the museum would be the next best bet. It has been closed for renovations and today was the re-opening date. It was interesting in that it explained how pencils were manufactured but it was a little bit lightweight. After that it was on to the physical activity for the day, and probably the last big walk of the holiday. 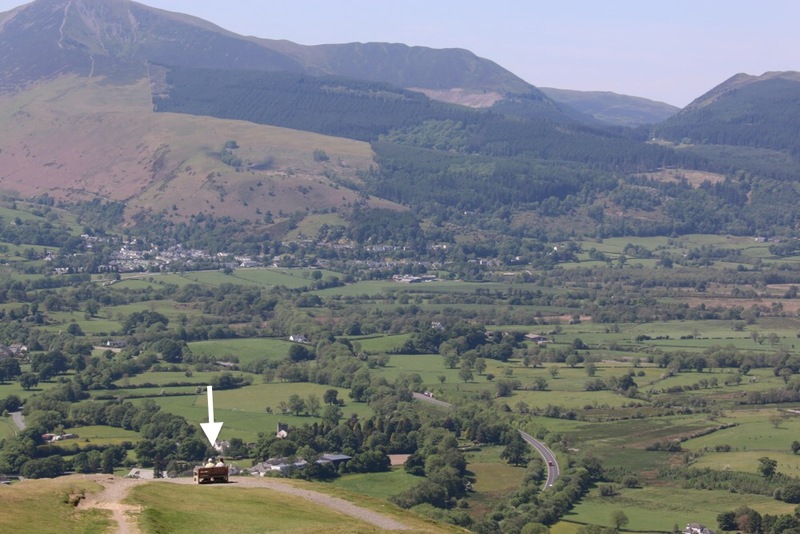 Latrigg is a viewpoint overlooking Keswick that is meant to be spectacular. I had downloaded a map from the internet that indicated I should be able to walk there and back in about 2 hours. 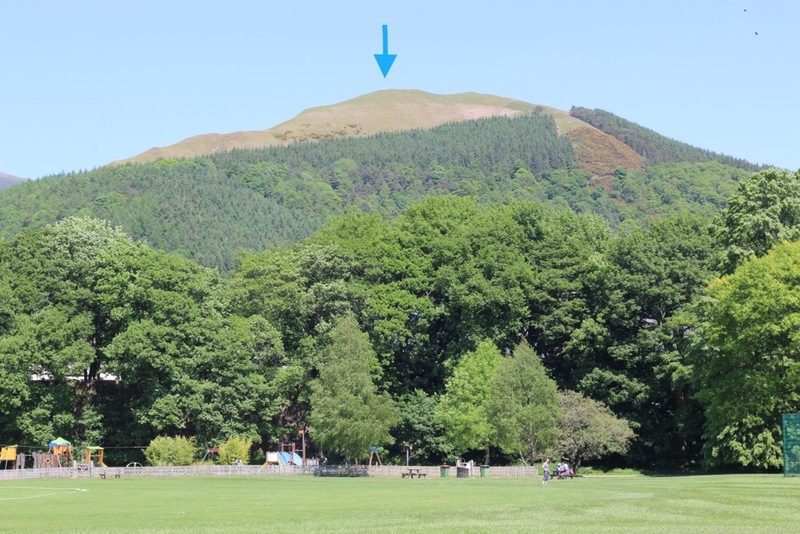 As I started the walk I looked at the fell (barren mountain feature) ahead of me and could make out people at the very top (see arrow below). Surely that wasn't where I was going? Not only did it seem like a hell of a hike, I didn't see how I could get there and back in 2 hours. Surely Latrigg must be a lookout part way up the fell? It wasn't. Latrigg was the summit and the climb was surprisingly manageable. Having said that, it was still hard work. On the way up I passed some sheep and goats who were, I assume, totally oblivious to their beautiful surroundings. The final stretch of the walk snaked up the side of the fell. And the view at the summit did not disappoint. I provided nearly 360 degree views. The main being Keswick and Derwent Water. There were fields, fells and other lakes in other directions too. At Latrigg there was a viewing bench occupied by a couple of ladies for the entire duration of my stay at the top. I can only assume that they were determined to make the most of the effort it took to get up there. It was interesting to see the architecture of Keswick from above. Perched at the top of the fell, I reflected on where I was. It was a definite "pinch me" moment and feeling of intense gratitude. At the top I met a couple and we exchanged some stories of our ascent as well as adoration for the view. I spent a good 30-45 min at the top, finishing by taking some photos I hope to be able to stitch into a panorama. Then it was time to descent. Fortunately, a much less strenuous activity. I made it down to Keswick just before 2:00pm. My parking was due to expire at 2:30pm so I topped it up to give me a little time to wander around the town. Quite by chance I made it down to the water's edge. On my way back to the car, the image of these grand houses and the mountains behind caught my attention. On the way back to the hotel I made my second attempt to find the famous gingerbread, having done some extra research. This time I found it. The shop is tiny and adorable (should have taken a photo) and clearly well known with a steady stream of customers. As for the gingerbread, as described it was quite different - hard to describe how - and quite delicious. One more night, then the final leg of my holiday down to London. The food at this hotel has been outstanding - the best of the trip so far - but I've definitely felt conspicuous as a solo traveller here. The place is teeming with couples. It makes it a little bit tougher but I haven't let it spoil my time.